» Is This Boston’s New Crunch-Time Play? 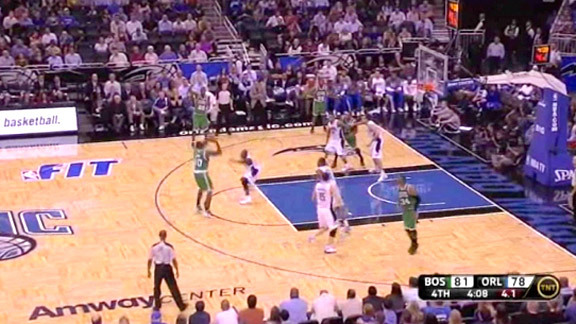 Is This Boston’s New Crunch-Time Play? On Thursday night, the Boston Celtics pulled off a memorable comeback, rallying from a 27-point deficit to beat the Orlando Magic for the second time this week. That’s the main story, but I’d like to zoom in on a quick-hitting play the Celtics ran in the fourth quarter that has the potential to become one of their late-game standbys. Ray Allen and Rajon Rondo missed last night’s game, so both teams knew that the basketball would be in Paul Pierce’s hands. 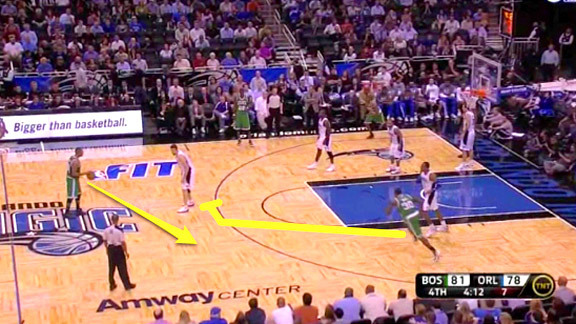 Instead of simply isolating Pierce, Doc Rivers drew up a pick-and-pop set for Pierce as the primary ball handler. Rivers put some thought into this play. He didn’t just give Pierce the ball at the top of the key and say, “Take it and come off a ball screen.” The remaining Celtics positioned themselves in different spots on the court each time they ran the pick-and-pop to give Orlando’s defense different looks. In this case, the play starts with Chris Wilcox setting a pin-down screen for Pierce. 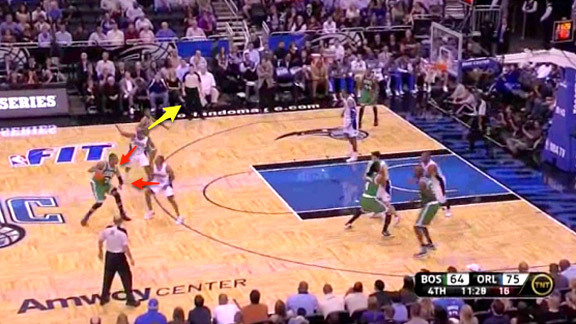 Once Pierce uses the screen and cuts to the perimeter, E’Twaun Moore quickly gets him the ball. Once Pierce makes the catch, Moore follows his pass and sets a ball screen for Pierce. Pierce squares up his man and takes him into the screen. Orlando plays the screen by having Moore’s man show hard on Pierce while Pierce’s defender trails Pierce over the screen, in what essentially becomes a double-team on Pierce. Moore, the screener, flares out and looks for the basketball. Pierce passes to Moore, who hits a quick 3-pointer before his man can recover to him after showing hard on the screen. After seeing this pick-and-pop work at the beginning of the fourth quarter, Doc Rivers waited until crunch time to use it again, and this next time it came with a twist. With less than five minutes left in the game, Rivers was using Pierce as the Celtics’ primary ball handler. But they didn’t run him off a high screen looking for a pick-and-pop as soon as he brought the ball across half court. 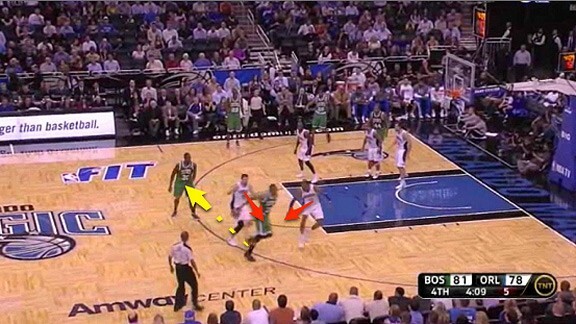 Here, the Celtics start the possession with a staggered ball screen, which Pierce uses. Then he takes the ball to the top of the key. The staggered screen wasn’t run to get an open shot, but to space out the defense. 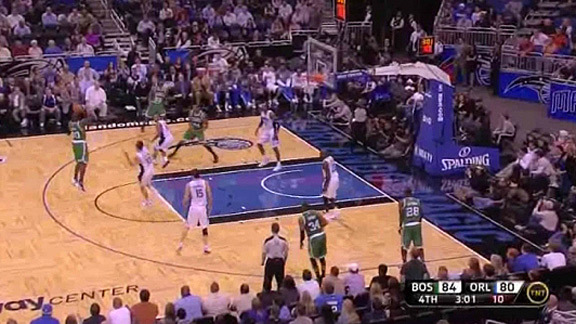 Next, Brandon Bass sprints to the top of the key and sets a ball screen for Pierce. Pierce uses the screen, and once again the big defender shows hard while Pierce’s man works over the screen, resulting in a double team on Pierce. 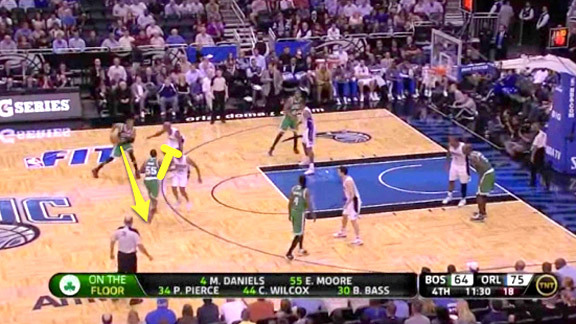 Pierce feels the pressure and quickly throws a behind-the-back pass to Bass on the perimeter. Bass squares up, looking for the jumper. Bass’ original defender was pulled so far out of position when he left to double Pierce that he can’t even attempt to block the shot. This leaves Jason Richardson to rotate over and challenge Bass’ shot. Richardson doesn’t get there quick enough and Bass knocks down the open jump shot. A minute later, Rivers called the same pick-and-pop, this time with a new scheme to start the play. The possession starts with Wilcox setting a down screen for Bass, who uses it and gets into position to set a ball screen for Pierce. 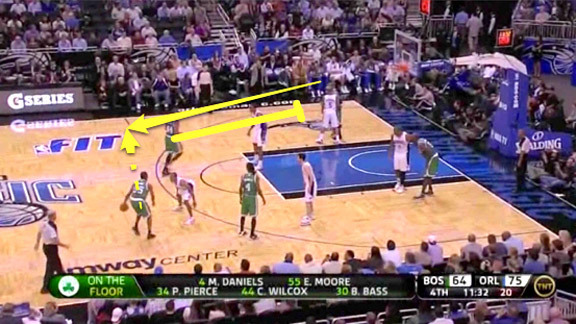 As soon as Bass arrives and sets his feet, Pierce dribbles around his screen. 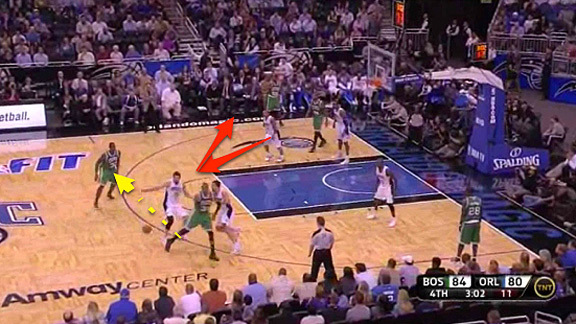 The nice part of this pick-and-pop is that the Celtics had Bass go from a dead sprint to setting a ball screen. This doesn’t give Bass’ defender, who just fought through Wilcox’s pin-down screen, much time to chase Bass to the top of the key and defend the pick-and-roll. 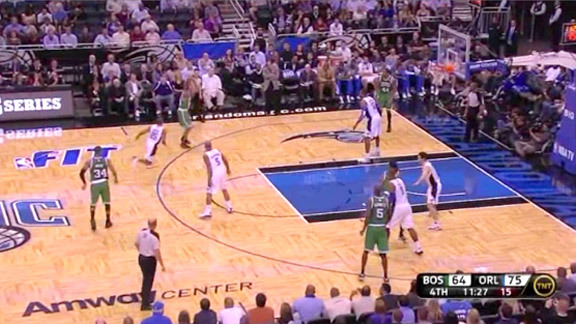 As Pierce comes off the screen, the Magic try to defend it the same way as before. The screener’s man shows hard and Pierce’s defender goes over the screen to double-team him. Pierce again senses the double and sends a quick behind-the-back pass to Bass. 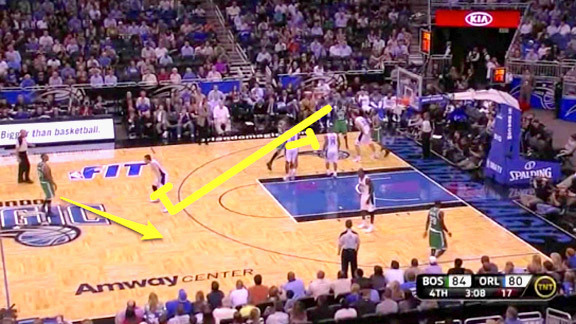 Pay attention to the Celtics’ spacing here. All three players not involved in the pick-and-roll are standing along the baseline to provide space for the play. This stretches the Orlando defense out and makes it almost impossible to cover Bass’ shot on the pick-and-pop. In this defensive scheme, Jameer Nelson is supposed to stunt at Bass when he catches the ball and try to force him to hesitate long enough for Bass’ defender to recover. However, because the Celtics are spaced so well (and because Moore, Nelson’s man, was making jumpers), Nelson only makes a brief stunting motion. He takes a quick step toward Bass and then runs back to his man. Nelson’s stab in Bass’ direction wasn’t enough. Bass, wide open at the top of the key, converts another jumper to give Boston a six-point lead and effectively end the game. This high pick-and-pop is an impressive quick-hitting set for the Celtics. If works with Wilcox, Moore, and Pietrus on the court, imagine how effective it can be when Allen and Rondo return. 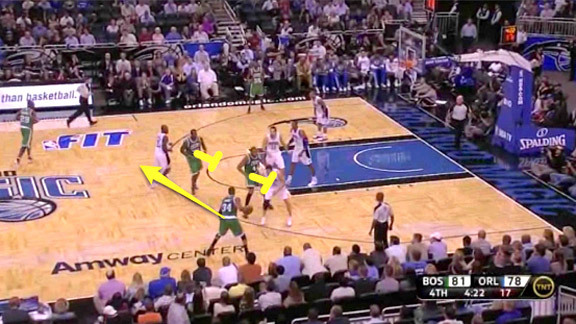 Boston may even want to try a few pick-and-pops with Pierce as the ball handler and Allen as the screener. If it gives Allen some breathing room to shoot a 3, we all know how that ends up 56 percent of the time. That said, advanced statistics suggest there may be a better approach to guarding Boston’s pick-and-pop than the one Orland used. Instead of doubling Pierce, the defense might want to play him straight-up. In pick-and-roll situations, when Pierce looks for his own offense, he shoots 24.1 percent and commits turnovers 24.5 percent of the time. The Celtics are much more dangerous when he sets up his teammates. When Pierce passes out of a pick-and-roll, the rest of the Celtics are shooting 52.2 percent. The numbers say defenses should try to keep the ball in Pierce’s hands, but are they willing to do that with the game on the line? Against a player with Pierce’s clutch-shooting résumé, that question could give opposing coaches nightmares.